The 17th FINA World Championships was held this summer in Budapest with big success. The competitions took place in some iconic sites of Budapest. Hungarian foundation contractors took significant part in the construction of the facilities for this fantastic sport event. It was a huge challenge for all the companies to finish these impressive buildings for the FINA Championships, since the preparation period was really short for this huge event. 1. 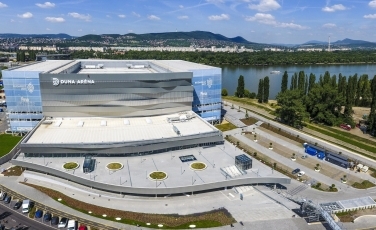 Budapest’s new wonder, the Duna Arena Swimming Complex with two Olympic-size pools is an outstanding building near to the Danube River on Pest side. BOHN Mélyépítő Kft took part in the design and construction works. Due to the unfavourable soil conditions deep foundation was required. The complex stand on 2.171 pcs Ø600-800-1.000 mm diameter CFA piles in a total length of 27,775 meters. The biggest challenge was the tight transit time, which often required daily recalculation during on-site organization. During the major part of the work three concrete manufacturers supplied the concrete to three different drilling machines, while the reinforcement cages of the piles were made by fife reinforcing steel manufacturers. To build the promenade and improve the flood defence system along the riverside, Bauer Hungary Ltd. executed 8.733 m2 watertight reinforced concrete 400mm thick diaphragm wall next to the Danube. In order to stay on the tight schedule of the project, the Company was involved not only as a foundation contractor, but provided technical counselling to the deep foundation designer to speed up the design process. Bauer organized day and night shifts to improve the performance of the D-Wall works. Bauer drilled also the foundation piles under the temporary stands with CFA method using diameter 600 and 800mm. 2. HBM Soletanche Bachy has completed the foundation works of the 30m high Diving Tower which was designed using 15 pcs 17 m long and 2 m diameter piles, with 10 m embedded in the riverbed of the Danube (through a 7-8 m depth of water). HBM mobilized onto the Danube River 480 tons of equipment and material using a triple barge system. To accomplish the piling HBM’s team installed 13 m long steel tubes into the riverbed to a depth of 4-5 m by vibration. In the protection of the steel tubes to retain the Danube, Kelly case drilling with bentonite slurry was performed down to -17 m depth, and 17 m concreting was completed from the quay of the Danube. It was a challenging work due to the unusually high and constantly changing water level of the Danube and because of the very limited space availability on the water and also on the quayside. 3. Bauer Hungary Ltd. carried out the special foundation works of the temporary pools installed atop the Lake in City Park, where the synchronized swimming contests were hosted. Here was also soil improvement needed to increase the bearing capacity. Bauer designed a so-called rigid inclusion method, which is combination of a shallow and deep foundation structure, having a separation layer in between. The company successfully performed almost 1.000 pcs of 60 cm diameter vibrated stone columns to act as the deep foundation structure. In spite of the short deadlines all these foundation works were completed in time with great success, much to the client’s appreciation. Beyond all expectations, fans turned out in extremely huge numbers at the 17th FINA World Championships. More than 485,000 spectators filled the stands during the 17-day showcase while further 400,000 enthusiasts visited the fan zones.